The exhibition and book focuses on several mediums including color woodcut, intaglio, serigraphy and lithography. The influences of Japanese prints and regional appropriations of international movements are examined as well as the local production of white-line, or Provincetown prints. The style and subject matter ranges from works inspired by the Arts & Crafts Movement to modernism and abstraction. The exhibition functions to reinstate the reputations of some of the artists, introduce their work to a wider national audience and to illustrate the innovations and contributions that some of the artists made to the medium. Several of the artists had reputations that extended outside of the region and had influenced printmaking by their contributions nationally and internationally. In the first decades of the 20th century, the Seattle Fine Arts Society, forerunner to the Seattle Art Museum, was the region’s main art venue, especially for regional artists. They also sponsored several national and international exhibitions of graphic arts, particularly Japanese Ukiyo-e prints which were very popular with the public. In 1916, the first local exhibition of color prints by American artists was featured in Seattle, following their display at the 1915 Panama Pacific Exposition in San Francisco. These exhibitions gave exposure to regional artists who would soon become interested in learning the techniques for their own use. The University of Washington ‘s Art Department began flourishing in the early 1920’s and color printmaking received special attention from faculty members like Ambrose Patterson and Helen Rhodes. Patterson had already created a body of work in color woodcuts by 1918 in Europe, Hawaii and California. Rhodes had traveled to Provincetown before 1924 to learn color printmaking. Elementary school instructors such as Spokane’s Ruth Fisken, and Seattle’s Maude Kerns were strong supporters of color printmaking and disseminated the teachings of Arthur Wesley Dow to their students. After moving to Eugene, Oregon, Kerns went on to become an important non-objective painter with a substantial national reputation. Although these women created very few prints themselves, some of their students went on to produce credible bodies of work in the medium. The Japanese printmaker Yamagishi Kazue came to Seattle in 1928 and 1929 to teach the traditional methods of creating color prints from multiple blocks, imparting first hand experience to local artists who had been self instructing using books like F. Morley Fletcher’s Woodblock Printmaking, of 1916. At least three regional artists attended the Yamagishi classes, Robert Bruce Inverarity and Waldo Chase and Corwin Chase, two brothers who produced painterly color woodcuts in the Japanese tradition and lived in teepee’s, working in remote area’s around Puget Sound. The formation of the Northwest Printmakers Society in 1928 also provided an impetus for regional printmaking. Their first exhibition in 1929 featured numerous color prints by local practitioners. The NWPS soon became national and international attracting a diverse group of artists including Pablo Picasso in 1936. Another organization where printmaking figured prominently was the Women Painters of Washington, which formed in 1930. Several of the founders and early members produced highly skilled color prints. They occasionally featured print exhibitions by their membership throughout the 1930’s and 40’s. The Public Works of Art Project and WPA/Federal Art Projects also provided funding and materials for the creation of color prints. These included the experimental collaborative lacquer airbrush stencil prints of Hans Bok and Otho Barnes. Malcolm Roberts, an openly gay artist on the project, produced lithographs, many in color that reflected his interest in Surrealism and unusual male imagery. In the early 1940’s, the noted Mexican-American artist Emilio Amero came to Seattle to teach at the University of Washington and the Cornish College of the Arts. He was an ardent promoter of color lithography and taught the technique to many of the local artists including Helmi Juvonen. A unique and experimental artist, Juvonen’s work defies simple categorization. Her linocuts are extremely experimental and show many different cultural and stylistic influences. 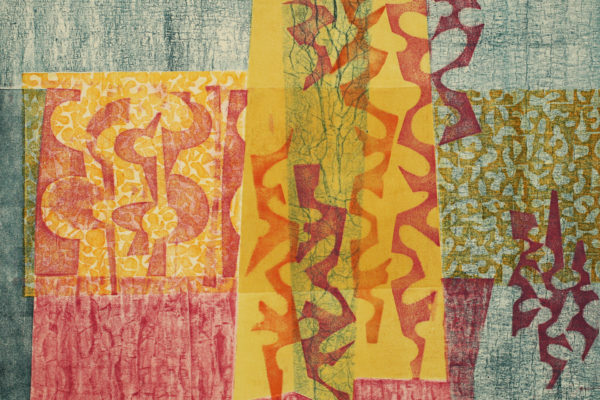 The exhibition concludes with the international success of several regional printmakers during the 1950’s whose innovative work exerted an influence that continues to this day.